The term Brutalism is used to describe a form of architecture that appeared, mainly in Europe, from around 1945 – 1975. Uncompromisingly modern, this trend in architecture was both striking and arresting and, perhaps like no other style before or since, aroused extremes of emotion and debate. Some regarded Brutalist buildings as monstrous soulless structures of concrete, steel and glass, whereas others saw the genre as a logical progression, having its own grace and balance. Here, Alexander Clement introduces Brutalism as seen in post-war Britain, giving the historical context before studying a number of key buildings and developments in the fields of civic, educational, commercial, leisure and entertainment, social and private, and ecclesiastical architecture. Stunning photographs clearly show the main characteristics of each building, and there are profiles of the most influential architects. Now that the age of Brutalism is a generation behind us, it is possible to view the movement with a degree of rational reappraisal, study how the style evolved and gauge its effect on Britain’s urban landscape. 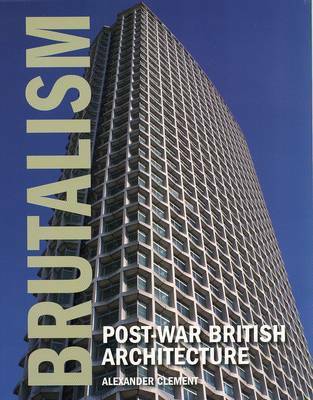 Aimed at anyone with an interest in architecture, this book offers such an analysis, and considers the future for Brutalism.